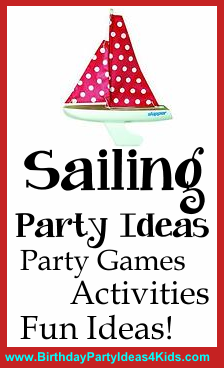 Sailing party ideas to help plan a nautical or sailing theme birthday party for kids. Includes ideas for sailing themed decorations, invitations, games, food, favors, goody bags and much more. Invitations with pictures of sailboats - cut out pictures of the birthday child and glue them on the cards so it looks like they are on the boat. On note cards with a boat scene embellish them by cutting out sails from white fabric that match the sails on the card and then pasting the fabric sails on the card. Only paste down one side of the sail so it looks like it is moving in the wind. Print out the party information on colorful paper and then fold into paper boats. Decorate the party area with large pieces of fabric attached to the walls to look like sails. Cut out waves from blue construction paper and attach to tables, mantles, countertops and staircases. Decorate the party table in blue, white, red and yellow. Place sand in the center of the table with a few seashells. Serve snacks in large seashells and/or colorful plastic kids pails and use shovels for serving. Write guests names in blue or red (or a combination) permanent marker on white sailor hats. Let the kids decorate with markers, paint or stickers. Make party guests into boats by giving them their own "sail". Make or buy capes in bright colors and let the guests wear them. Fill a small plastic kids pool with sand and scatter in different sizes of containers for kids to make sandcastles. In the center place a bucket full of water so they can make the sand wet. For older children (over age 3) give them marbles, coins or plastic jewels to decorate the castles. Fill a large rectangle container with water (about 2 inches from the top) and place a floating plastic sailboat in the center. On each of the containers sides tape a piece of yarn or string about 4 - 5 inches from the containers ends. Two players line up at opposite sides of the container and use squirt guns to try make the sailboat touch the other persons string. Have smaller containers of water at each side so they can refill the squirt guns during the battle. Before the party begins make at least 5 islands out of poster board that are about 15" square. Decorate them so that they look like islands. During the party ask the sailors to use the island pieces to sail across the sea and back. You can break them into teams for a relay style race or have them use teamwork and play the game all together. They sail across the ocean using only the 5 islands by placing the islands on the ground, standing on them and then moving the back island to the front and then they all move forward and the process repeats. If they step off the island into the ocean then the whole team has to go back to start and begin again. Send party guests "sailing" to find items on a neighborhood scavenger hunt. 2 free lists to print out plus complete directions on our Scavenger Hunt page.